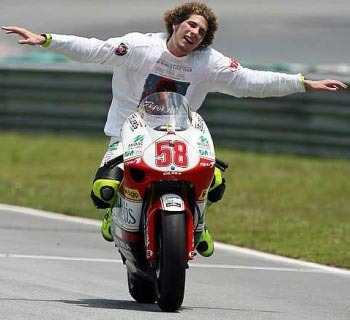 For the second weekend running the world of motorsport was left mourning one of its own after exciting young Italian rider Marco Simoncelli was killed in a horrific accident at Malaysian round of the MotoGP championship at Sepang on 23rd of October 2011. Simoncelli fell and was hit by Colin Edwards and Valentino Rossi as he slid across the track on his Honda. 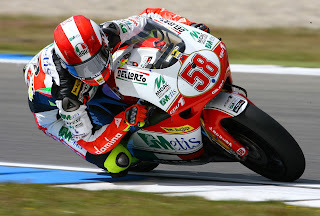 Simoncelli's helmet was knocked off in the incident and the race was immediately stopped. Yamaha's Edwards also came off his bike but escaped serious injury, while Rossi was able to control his Ducati back to safety. Simoncelli lay stricken on the track before being taken to the circuit's medical centre where he was confirmed dead. Simoncelli's death is the first in the premier class since another Honda rider, Daijiro Kato, was killed at the 2003 Japanese Grand Prix. Shoya Tomizawa also died in a similar crash to Simoncelli in Moto2 last year. 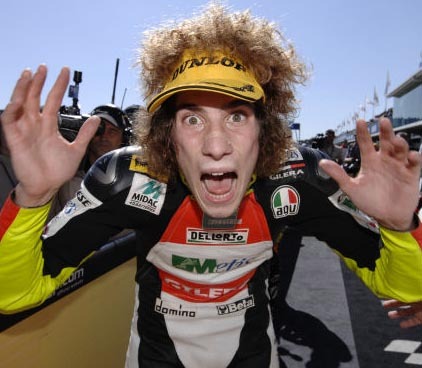 Simoncelli, known for his fashionable haircut and fun-loving personality, began in the 125cc class in 2002 before moving up to the 250cc class in 2006. He won the 250cc world title in 2008. Computer pioneer Dennis Ritchie Gone!